...but if you try sometimes you just might find, you get what you need! No truer words have ever been spoken...or sung. Thank you Mick Jagger! 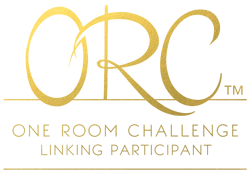 I had posted before about entering the One Room Challenge and also about not being able to complete it in the allotted amount of time due to our travel and work schedule. Well, we are still not totally finished, but are well on our way. Since it has been a while, I thought I would share an update with you. I really wanted to find a vintage piece of furniture for this half bath. Unfortunately, I couldn't find anything that would fit because of the dimensions, so I just let it sit and didn't do anything....because I couldn't get what I wanted. ...vanity from Lowes. And you know what? I'm happy with it. It's not what I wanted, but it has turned out to be what I needed! My original plan was to find a vintage piece of furniture and modify it to hold a sink, add board and batten treatment on the walls and hang this beautiful mirror. All of that went straight out the proverbial window! We brought the mirror into the room several times and it just didn't look right, primarily because the mirror was the exact width of the bathroom. It just looked off. 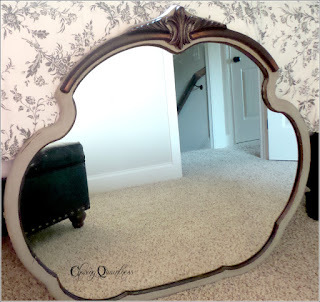 Fortunately, I have lots of empty walls in the house and this mirror will be perfect somewhere else! I also decided that the board and batten would be too busy for the room. This half bath is 3 feet wide and almost, but not quite, 6 feet long. I kept telling myself to keep it simple...to chase quaintness! :-) We added a chair rail pretty high up on the wall and I painted the chair rail and the wall below the same color as all of the trim in our house, PPG's Colonial White in semi-gloss. I still want to do something decorative to the lower wall, but will let what's there sit and see what happens. After getting some decor in the space, I may decide it needs nothing else. I have found that sometimes less is sooooo much more, especially when I try to force an idea that doesn't work. By the way, the hubster has agreed that the dark color, Peppercorn, will look pretty good on the top portion of the wall. While none of my other ideas have worked for this space, I'm good with it...I got what I needed....a vanity with storage, which was one of the major reasons for redoing this space. I will post photos next week when I get the mirror up (which is not anything that I would have picked) and a few things back in place. I'm still looking for the perfect light...it will come in time! I love the mirror and it will look great on another wall. Sometimes you just have to go with the flow of the room! Most definitely and that little bathroom did not want that mirror! :-) Thank you!! You are so right, sometimes things just fall into place the way they were meant to be all along and in the end it will look just as beautiful as your first visions were! I love the vanity you picked, so much nicer than a pedestal sink! That mirror will be gorgeous wherever you hang it, and in a new home there are always walls to fill! Thank you so much Kimberley! This vanity is nothing like I wanted but it is perfect for the little bathroom. I am anxious to get finished with it, but the schedule is filled with other things right now. Painting above the chair rail will have to wait until January, unless I can find a day to get it done. I’m looking forward to finishing and have a project completed! Glad you enjoyed it…I love the song! Hugs sweet friend! Can't wait to see room.....you are so right, everytime that I have tried to force the decorating issue it hasn't been good.....so I have learned patience and a wait and rethink the situation attitude (which is very hard for me) and it works much better for me and the hubs! Hug! Thank you! I'm so looking forward to getting it finished and hope that I can before too long. It's just one of those "thorn" projects for some reason. It's hard for me to exercise patience also because I want it done "yesterday"...LOL. I'm trying to stay positive! Hugs!! That mirror is drool worthy!!!! That mirror is awesome. I know it will all come together beautifully. Ha ha so know about learning to be patient in life!!!! Sometimes if you take your time and wait the best will be! Decorating requires patience for some reason...LOL. I'm learning to be patient with this room and let it fall into place instead of forcing things that don't belong. It is definitely difficult for me...LOL. And thank you..I love the mirror also! Hugs! Sometimes what is in your head doesn't translate onto the wall! But it usually turns out even better when you start playing with it. You just have to "let it go" and "just do it". Oh boy, that was corny!! On a different note…thank you so much for that wonderful gift!! How awesome! AnnMarie…that is just so sweet and it is so pretty…and extra special because you made it!! The hubster loved it also and thought it was so kind of you. It will definitely be a part of my Christmas décor from now on….a special beautiful treasure from a special beautiful friend! Love and hugs to you sweet friend!! I'm excited that you're going with Peppercorn. Pottery Barn has it in the local store on quite a few of their walls and I really want to use it too. Waiting to see how it turns out in a small space before I make a commitment. Me too...I just love this color...it is so dark but so elegant. I do hope it works in this small bathroom. I was hoping to get it painted before Christmas but that isn't going to happen, I don't think. Maybe I can squeeze the time in somewhere and get it done...I'm really excited about it! I will keep you posted! I have that same vanity in our downstairs guest bath :). I know what you mean about wanting to find the perfect pieces. I mean, you really only get to do it once (unless you are a Rockefeller). 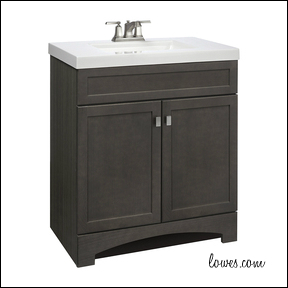 I really do like the Lowe's vanity. And I don't know if I missed it but is the mirror a vintage find or did you purchase it somewhere, as in can I get the same EXACT thing??!!! Love it. LOL @ indecisive….that is too funny! I usually am also and have had a difficult time with this bathroom. The mirror is a vintage find and I just knew it would be perfect for this bathroom, but it wasn’t…so it will hang somewhere else and make me happy! :-) Thank you so much….we’ve been happy with the vanity so far….it works, it fits, it looks good and it was on sale! :-) Hugs!! some things just can't be rushed! aren't you glad now that you waited a bit! I agree and I am glad that I waited instead of trying to rush this project and stick things in there that didn’t work. It does have clean, simple, elegant lines and works in this small bath perfectly! Thank you so much! Love and hugs!! Don't I know it. There have been times when I knew exactly what I wanted and turned the world over to get it only to change my mind of find that it wasn't right after all :-) Looking forward to seeing the finished room. Thanks so much Amalia...and doesn't it always happen that way? We think we are so sure of what we want and what needs to happen, only to find out that the house kicks the idea to the curb...LOL Have a great weekend! Hugs!! Thank you so much Rhonda! I like the plans to come together like they are in my head, but you are right, they seldom end the way they started...which is sometimes a very good thing! Hope you have a great one also! Hugs! I feel your pain! It's so hard picking out stuff that matches what you envision... I love the color peppercorn! I think that alone will make a huge statement. I need new vanities too. The ones from Lowes are pretty to me. And it is a painful process sometimes…LOL. I see things the way I want them and feel like Lucy when it doesn’t go as planned! I love the peppercorn also and hope that it works in this space. I’m itching to get it painted but am struggling finding the time…hopefully before the holidays are over and done it will get finished. Lowes really has a good selection and so does Home Depot! Thank you so much! Hugs! I know what you mean...it doesn't seem to matter what I plan, the house has ideas of its own. And yes, I believe they do! :-) Thank you so much! !